The City Commission officially adopted the flag in the summer of 2007 and the flag was dedicated in October of that year as a part of a fall community celebration. The slogan, "Queen City of The Cimarron," is of long standing and dates back to the 1880's. The flower in the middle of the design is an Indian Blanket, Oklahoma's state wildflower. The water tower is still in use and stands in the downtown area. The caricature is of "Pistol Pete" whose real name is Frank Eaton. There are many stories about Pete, who as a Deputy Federal Marshall avenged his father's death by tracking down and eventually killing five of the men who shot the senior Eaton in cold blood in Pete's youth. He was considered one of the west's fastest draws who also shot with great accuracy. He moved to the Perkins area in 1889 when he was 29. Additionally, Pistol Pete became the mascot for Oklahoma State University - then Oklahoma Agricultural and Mechanical College. Frank Eaton's home is located at Perkins' very own Oklahoma Territorial Plaza, and visitors are welcome on summer Saturdays from 1-4 p.m. or by appointment. Call 405-547-2445 for more information. The river represents the Cimarron River, which is near the south border of the city. The wooden bridge is a representation of the first bridge that crossed the Cimarron River. The bridge has since been replaced with a concrete structure. The shield represents the Native American population that lives in or near Perkins. The Iowa or Ioway Tribe has its headquarters about 4 miles south of Perkins. 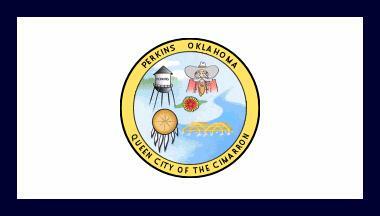 Other tribes and nations are represented by citizens of Perkins. Read MORE about the flag.